Living in the Shadow of His Hand: A Goose or a Chicken? 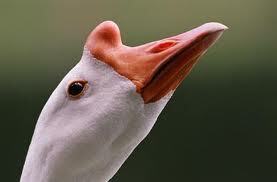 When I was growing up we had a guard goose. Yes, that’s right, a goose. My Dad raised him from an egg that he placed under one of our chickens that was hatching her own eggs. You can imagine the surprise she had when one day out pops a white goose, long necked, big orange bill, and he didn’t sound anything like her little fluffy yellow chicks. It was the funniest thing to watch him follow the hen around, towering over her with his long neck! It was even funnier to watch the hen when we would have a heavy rain, and the goose would go into water that would pool into the ditches. She would pace back and forth at the edge of the water, frantically afraid that her baby goose would drown! In the yard, should anyone or anything come toward the hen and her chicks, they would run in the opposite way as fast as their spindly lets could take them. But the goose would stand there, chest out, head held high, fluffing his feathers and quacking his head off in adversity to having his personal space challenged! The goose reminds me of the story of Peter in the courtyard of the High Priest after Jesus was arrested in the Garden of Gethsemane. But instead of being a goose - he became a chicken! Oh, Simon Peter wanted to be like the goose! In Mark 14:27-30 Jesus is telling His disciples that the time is soon coming when He will be taken from them, and in fear they will be scattered like sheep without a shepherd. But proud Simon Peter says “Even if all are made to stumble, yet I will not be.” He was so sure of himself, and that His love for Jesus would meet the test of fear. But Jesus answered him and said “Assuredly, I say to you that today, even this night, before the rooster crows twice, you will deny Me three times.” Oh no! Not Peter! He answers Jesus back that “If I have to die with You, I will not deny You!” Sure Peter, stick your chest out, hold your head high, and squawk! Hours later, they are in the Garden of Gethsemane, and the guards come to arrest Jesus. Simon Peter still has his courage! He, attempting to protect Jesus, even drew his sword and cut the ear off one of the guards! Peter loved Jesus as a disciple should. But when Jesus was taken from them and he met opposition, fear overcame him. News travelled fast in Jerusalem. Within just a few hours everyone knew about Jesus’ arrest. Simon Peter and another disciple had followed Jesus and the army that arrested Him into town. The other disciple, who knew the High Priest, entered into the courtyard, and Peter waited outside until the disciple sent for him. And then the rooster crowed. The gavel strikes the bench. Peter’s test was over and he had failed. Can’t you just feel Peter’s heart breaking as he remembers Jesus’ warning to him that before the rooster crowed twice, he would have denied him three times? Simon Peter, strong and courageous, brave enough to draw his sword to protect His Lord, believing enough to try to walk on Water with Jesus, cried. Peter needed to be tightly connected to God at this time of trial, and instead he allowed fear to overcome him. Jesus knew it would, and had even warned him. More than that, Jesus had told him what to do to overcome. In Mark 14:37-38, while they’re still in the garden and Jesus is praying, He comes back to His disciples to see them sleeping. He addressed Simon Peter directly. Waking him, He says, “Simon, are you sleeping? Could you not watch one hour? Watch and pray, lest you enter into temptation. The spirit indeed is willing, but the flesh is weak.” Watch and pray, Peter, because even though you want to be courageous like a goose with your chest out and your head held high, your flesh is that of a chicken, fearful, running at the first sight of adversity. Prayer brings courage because it stirs up the spirit of power, love, and a sound mind that Christ has given us (2 Timothy 1:7). Prayer dismisses thoughts of what might happen, and gives us the shield of faith that allows us to stand and fight against the fearful worries that satan will throw at us (Ephesians 6:16). Without prayer, we have no power source, and we really are nothing but a bunch of chickens, running from anything that moves in our direction.